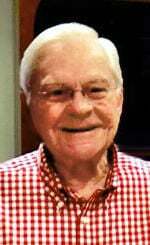 Janesville, WI -- Ronald S. Staben, age 88, of Janesville died on Wednesday, February 6, 2019 at Mercyhealth Hospital & Trauma Center. He was born in Freeport, IL on February 11, 1930, the son of the late Herbert W. and Gertie L. (Orendorf) Staben. Ron graduated from Freeport High School, and worked as a switchman for the Illinois Central Railroad. During the Korean War, Ron enlisted in the U.S. Army on November 26, 1951, serving until he was honorably discharged. While in the service, Ron was introduced to the former Mary Alice McCoy, and they were married on November 2, 1952. Ron was an active member of St. Paul's Evangelical Lutheran Church, and First Lutheran Church for many years. Ron had a very profound and strong commitment to his faith, his family, his business, and his customers, whom he was honored to serve over the years. After the war, Ron returned to college, and graduated from UW Madison School of Pharmacy. Ron, along his wife Mary, owned and operated Staben Pharmacy, that was located in the former Riverview Clinic. He retired when he sold the pharmacy in 1995. Ron loved being a pharmacist, and continued to work on a part time basis at local pharmacies until 2010. Ron was a lifelong fan of the Chicago Cubs, and was thrilled when they won the World Series in 2016. He followed UW Badgers sports, enjoyed fishing, golfing, canoeing, wood carving, doing crossword puzzles, and playing bridge. Ron enjoyed the fellowship during his annual canoe trips and weekly lunches with his cronies, and his family trips to Door County. Ron was a true gentleman, and will be dearly missed by his family and all those who knew him. He is survived by his wife, Mary; two daughters, Cindy (Patrick) Morrison of Batavia, IL and Julie (Bryan) Droste of Highland Park, IL; his beloved grandsons, David Morrison and Michael Morrison; his sister, Lori (Richard) Bailey of Simi Valley, CA; and many other relatives and friends. In addition to his parents, he was predeceased by his son, William David Staben. Funeral services will be held at 11 a.m. on Monday, February 11, 2019 at St. Paul's Evangelical Lutheran Church, 210 S. Ringold St., Janesville, with Rev. Daniel Decker officiating. Burial will follow at Oak Hill Cemetery with Military Honors provided by VFW Kienow Hilt Post 1621. Visitation will be on Sunday from 2 p.m. until 5 p.m. at the Whitcomb - Lynch Funeral Home, and again on Monday morning from 10 a.m. until the time of the service at the church. Memorials may be made in Ron's name to St. Paul's Lutheran Church K9 Comfort Dog Ministry, or the University of Wisconsin-Madison College of Pharmacy.